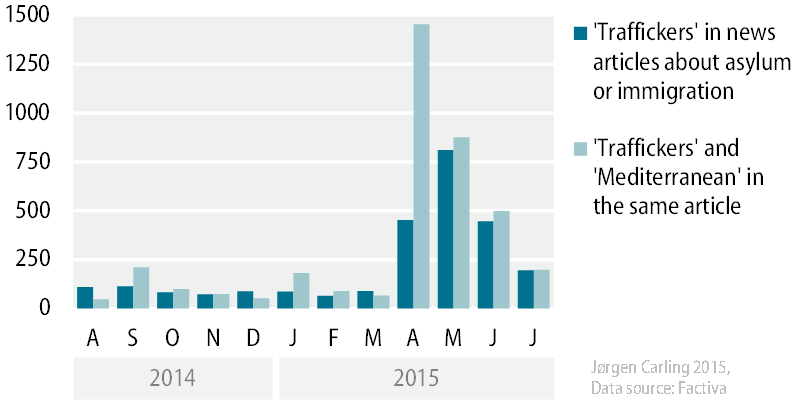 In early 2015 there was a spike in new stories about ‘trafficking’ related to migration. But most of the stories described events that had little to do with trafficking. They described smuggling of migrants, primarily across the Mediterranean. Does it make a difference whether we call it trafficking or smuggling? Yes, for several reasons. There are people who are forced, coerced or duped into forced labour, sexual exploitation or other forms of servitude — they probably count about 21 million. These are the victims of trafficking. Trafficking is most often associated with coerced prostitution, but slavery-like conditions are also common in fishing and other industries. The various forms of trafficking are crimes that need to be identified, prevented, and punished. Doing so is a difficult task, hampered by a range of challenges from legal loopholes and corruption to naive views of powerless victims in need of rescue. A starting point for progress, however, is a clear notion of what trafficking is. 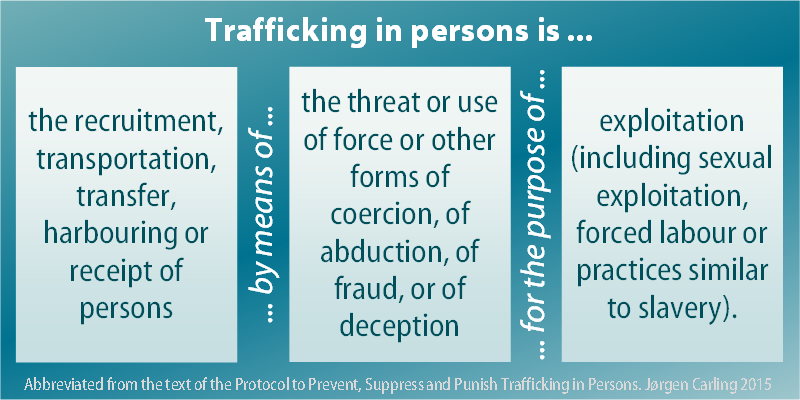 The legal text of the Protocol to Prevent, Suppress and Punish Trafficking in Persons can be deciphered to show the three pillars of defining trafficking. The first is the observable activity of recruiting, transporting, or harbouring people — things that are done in many contexts unrelated to trafficking. Second are the means by which this is carried out: force, threats, coercion, deception. Finally, there is the purpose of exploitation. When any unauthorized transportation of people across borders is labelled ‘trafficking’ we lose the ability to pinpoint and prevent truly exploitative crimes. There’s a second reason for avoiding such mislabelling, which has to do with political rhetoric. Political leaders are under immense pressure to act in the face of migration crises, such as the one that has been unfolding in the Mediterranean. Several hundered thousand migrants have been brought to European shores and thousands have died on the way, but the migrants are largely unwelcome in Europe. There is a sense of urgency combined with political gridlock. Cracking down on smuggling is the easiest option for being assertive. But what if the smugglers are basically providing refugees with access to the protection they need and are entitled to? The costs and risks are high, but the vast majority of migrants receive the service that they pay for: they are brought to Europe. As a political strategy, the war on smuggling needs a rhetorical line of attack that casts smugglers as evil and cynical. If this portrayal succeeds, keeping refugees away from seeking protection can be presented as a way of shielding them from exploitation by smugglers. A simple tactic for vilifying smugglers is to call them ‘traffickers’. This usage not only undermines the efforts to combat trafficking, but also justifies anti-smuggling measures that ultimately make refugees and other migrants more vulnerable. Unfortunately, even high-quality news media often reproduce this labelling without realizing the political purpose it serves. 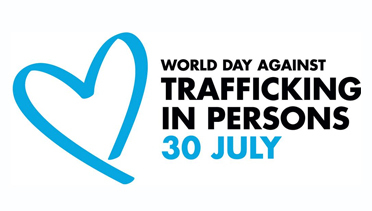 In 2013, 30 July was designated as the World Day against Trafficking in Persons. Since last year’s observation, trafficking has largely been in the news for the wrong reasons. By using ‘trafficking’ only when it is warranted, we can support the fight against exploitation and take a stance against opportunistic uses of a powerful word.